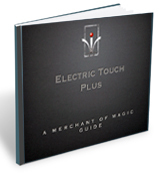 We have written a free eBook full of ideas and presentations for Yigal Mesika’s Electric Touch Plus. The Merchant of Magic team of magicians has shared performance tips and nuances to professionally perform magic tricks with the Electric Touch device. Ideas and tips for forcing and mindreading. How to use Electric Touch in your mentalism. Using Electric Touch with other magicians props. Related tips and advice to improve your magic. Your free ebook will be emailed to you instantly. We do not share your email address with anyone. The Merchant of Magic produces free guides, eBooks and tuition for magicians. The service is part of the customer care commitment from the team of magicians at MagicShop.co.uk.